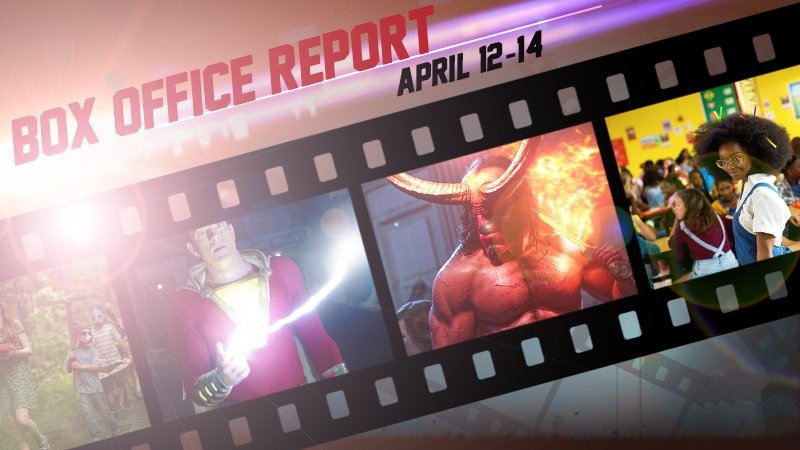 It was the tale of two superheroes, “Shazam!” and “Hellboy;” both lighthearted but each took very different paths at the box office this weekend. The film, directed by Tina Gordon Chism, stars 14-year-old Marsai Martin as the child an abusive tech executive (Regina Hall) reverts to after a magical spell is cast on her. Martin, the “black-ish” star, also executive produced the film, the youngest ever so credited in Hollywood history. It’s like “Shazam!” in reverse. It was an out-of-body weekend at the box office. The body-swap comic-book adaptation “Shazam!” — about a teenage boy (Asher Angel) who can turn into an adult-sized superhero (Zachary Levi) with a simple command — held solidly in its second week. Capitalizing on good reviews and word-of-mouth, “Shazam!” is Warner Bros.′ New Line’s latest DC Comics success. It has grossed $94.9 million through Sunday with a worldwide total of $258.8 million. 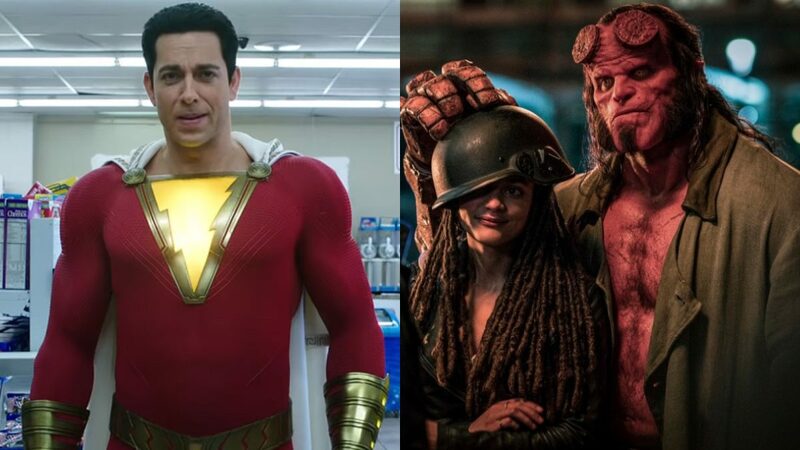 Lionsgate and Millennium’s “Hellboy” had been expected by many to vie with “Shazam!” on the weekend. But on the heels of terrible reviews (just 15% “fresh” on Rotten Tomatoes), it flopped with $12 million against a $50 million budget. It proved that a mix of wisecracks and superpowers were not a guarantee of success. Plus the absence of Guillermo del Toro and Ron Perlman, more than likely resulted in the less than stellar results. “Missing Link” also missed. It opened with a disappointing $5.8 million, marking a new low for Laika, the maker of eccentric animated tales such as “Coraline,” ″ParaNorman” and “Kubo and the Two Strings.” ″Missing Link,” distributed by United Artists Releasing, is about the discovery of a creature in the Pacific Northwest. Its voice cast includes Zach Galifianakis, Hugh Jackman and Zoe Saldana. “Bohemian Rhapsody” is the champion that keeps on giving five months after first hitting theaters. In February, China cleared the landing for it to hit theaters there much to the studios surprise. Fox made “Bohemian Rhapsody,” starring Rami Malek as the late Freddie Mercury, with New Regency and producer Graham King. “Bohemian Rhapsody,” which first hit theaters in early November, had already become the top-earning music biopic of all time before achieving its latest milestone. And it had already defied expectations in even crossing $800 million. Last week, Disney‘s 2019 Investor Day prominently featured music from the film following its recent acquisition of much of 21st Century Fox, including the 20th Century Fox film empire. 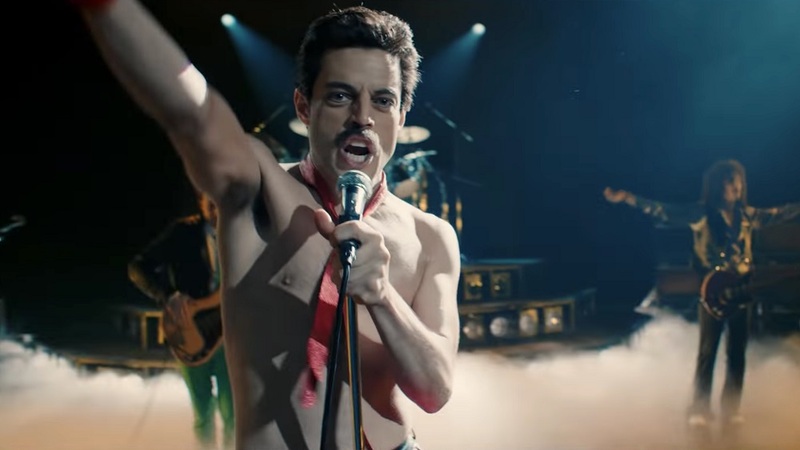 “Bohemian Rhapsody” won four Academy Awards, including a best actor win for Malek. And at the Golden Globes, it won for best drama and best actor in a drama. In terms of Fox titles, it only ranks behind “Avatar,” “Titanic,” “Star Wars: Episode I: Phantom Menace” after passing up the 2009 “Ice Age: Dawn of the Dinosaurs”($886.7 million). 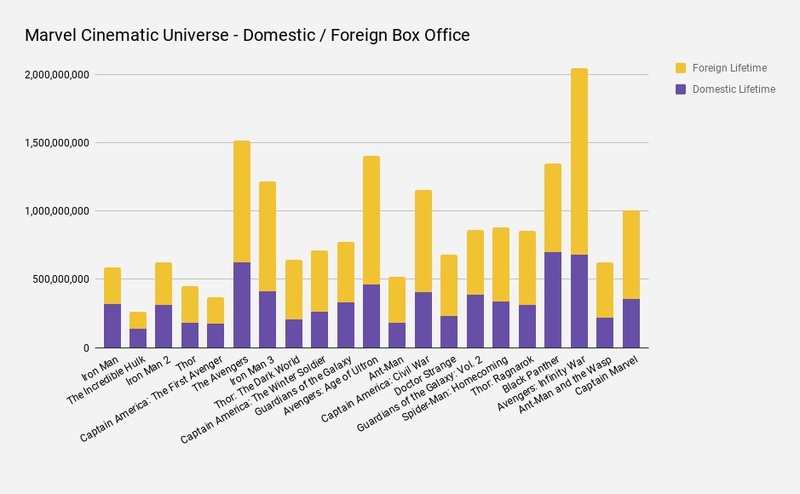 MCU, Captain Marvel US Worldwide Box Office Chart April 4, 2019. Courtesy Ishan. I would like to see a graph showing Captain Marvel’s profits both in the USA and worldwide, please.